I had forgotten about the red headed arkies. And mama would come back at him and call them a red headed Texan. 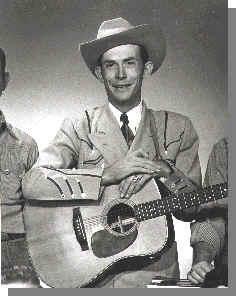 Do you remember the day Hank Williams Died? You Millard and Fred in the back seat and me in my spot in the back window. Mama and daddy had the whole front seat and they were singing "I'm So Lonesome I Could Cry" among others. Hank Died New Years Day about 5 or 6 months later. I was sitting at the kitchen table with daddy like I always did. Him drinkin coffe and watchin his paper fire underneath that old model A -that was my job to go out and start the fire while he was drinking coffee and watching me - he made me feel big - burn off the fog dampness before he tried to crank it. And than the news on that old radio broke in to say that Hank Williams was found dead in his back seat. New Years Morning. I have never seen the hurt on daddys face that I did that morning. That is something that really burned into my memory' knowing that even my daddy could be hurt. It has always seemed to me that no matter how hard we tried or worked from than on - that red headed arkie would catch up and run over us. Kind of like that "Steel Drivin Man". Its hard to beat machinery. I was outdated before I even learned how to tie my shoes. I hope I am not confusing you even more, Does this take care of the HUH? or the What? If not let me know what you don't understand and I will be glad to try again.